These adapters consist of a highest quality ZIF test socket connected to a circuit card with pins spaced on 0.1 inch centers for mounting on standard prototype breadboards. All pins and pads are wired one to one. SOT23-3-D3-ZL-S 3 Pin SOT23-3, JEDEC Spec TO-236 to DIP adapter with closed top ZIF socket. 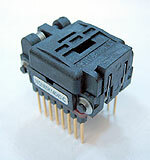 TO263-D6-ZL-S 3 Pin TO-263 to DIP adapter with closed top ZIF socket. SOT-89-4-D3-ZL 4 Pin TO-243(JEDEC) SOT-89 to DIP adapter with closed top ZIF socket. 1.73mm (0.068") Tab Single contact centered on one side. 3.0mm (0.118") Pitch on the other side. MO178-5-D3-ZL 5 Pin MO-178 SOT-23 to DIP adapter with closed top ZIF socket. SC70-D3-ZL 5 Pin SC-70, SOC-353 Package to DIP adapter with closed top ZIF socket. SC70-D6-ZL 5 Pin SC-70, SOC-353 Package to DIP adapter with closed top ZIF socket. PIC10F200-SO23-6 6 Pin PIC10F200, PIC10F204, PIC10F202 PIC10F206 SO23 6 pin to 8 DIP adapter. DIP pins have the same signals as the DIP version of the chip. SO-23 ZIF socket. Adapts from SO-23 package to PIC10F20x DIP socket. Bottom wire wrap pins are DIP rows 300 mils apart. Pins are wired signal to signal from PIC10F20x SO-23 to DIP pins. PIC10F200-SO23-6S 6 Pin PIC10F200, PIC10F204, PIC10F202 PIC10F206 SO23 6 pin to 8 DIP adapter. DIP pins have the same signals as the DIP version of the chip. SO-23 ZIF socket. Adapts from SO-23 package to PIC10F20x DIP socket. Bottom solder tail pins are DIP rows 300 mils apart. Pins are wired signal to signal from PIC10F20x SO-23 to DIP pins. MO178-6-D3-ZL 6 Pin SOT-23, MO-178 to DIP adapter with closed top ZIF socket. SOT23-6-D3-ZL 6 Pin SOT23, TO-236 to DIP adapter with closed top ZIF socket. Bottom pins are square wire-wrap. SOT23-6-D3-ZL-S 6 Pin SOT23, TO-236 to DIP adapter with closed top ZIF socket. 8SSO12-D5-ZO 8 Pin SSOP to DIP pin adapter with open top ZIF socket. Pins are wired one to one. 10QFN-D6-ZL-S 10 Pin QFN closed top ZIF socket to pins. Pins are wired one to one. Bottom pin rows are round and 600 mils apart on 100 mil centers. 10TS05-D3-ZO 10 Pin SSOP adapter with open top ZIF socket. Pins are wired one to one. 14SO15-D3-ZO-P 14 Pin SOP to DIP pin adapter with open top ZIF socket. Pins are wired one to one. 14SO15-D3-ZO 14 Pin SOP to DIP pin adapter with open top ZIF socket. Pins are wired one to one. 14SO17-D3-ZO-P 14 Pin SOP to DIP pin adapter with open top ZIF socket. Pins are wired one to one. 14SO17-D3-ZO 14 Pin SOP to DIP pin adapter with open top ZIF socket. Pins are wired one to one. 14SO20-D3-ZO 14 Pin SOP to DIP pin adapter with open top ZIF socket. Pins are wired one to one. 14SSO17-D3-ZO 14 Pin SSOP to DIP pin adapter with open top ZIF socket. Pins are wired one to one. 14SSO17-D6-ZO 14 Pin SSOP to DIP pin adapter with open top ZIF socket. Pins are wired one to one. 16QFN50-3X5-D6-ZO 16 QFN adapter with open top ZIF QFP socket on a .1 inch DIP male pins breadboard pattern. For 3.3mm square, 0.5mm pitch package. 16SO15-D3-ZO 16 Pin SOIC adapter with open top ZIF socket. Pins are wired one to one. 16SO15-D6-ZL 16 Pin SOIC adapter with a closed top ZIF socket. Pins are wired one to one. 16SO21-D3-ZO 16 Pin SOIC adapter with open top ZIF socket. Pins are wired one to one. 16SO30-D3-ZO 16 Pin ZIF socket adapter for devices in 300 mil wide body SOIC packages. Pins are wired one to one. 16SO30NR-D3-ZO 16 Pin ZIF socket adapter for devices in 300 mil wide body SOIC packages. The sockets do not have IC body alignment rails. Pins are wired one to one. No IC alignment rails inside the socket. Fits odd sized or extra IC wide plastic body. 16SSO17-D6-ZO 16 Pin SOIC socket to DIP adapter for SOIC packages. Pins are wired one to one. Bottom pins are rows are 600 mils apart on 100 mil centers. 16SSO21-D3-ZO 16 Pin SSOP and TSSOP to DIP rows adapter for devices in 209-mil, 5.3mm wide, 16 lead SSOP package. C20QFN20L-D6-ZL-S 20 pad QFN MLF adapter is wired one to one. QFN pin 1 is at the top of the pads on the left side. QFN pin 1 is at the top of the pads on the left side. 20QFN20L-D6-ZL 20 pad QFN MLF adapter is wired one to one. QFN pin 1 is in the center of the top row of of the pads. QFN pin 1 is in the center of the top row of of the pads. Socket center pin is accessible for signal connection. 20QFN20L-D6-ZL-P 20 pad QFN MLF adapter is wired one to one. QFN pin 1 is in the center of the top row of of the pads. 20QFN20R-D6-ZL-P 20 pad QFN MLF adapter is wired one to one. QFN pin 18, center QFN contact on the chip side facing adapter PCB pins DIP 1 and DIP 20 is connected to pin DIP 20. All other pins are one to one. 20SSO17-D6-ZL 20 Pin SSOP Closed top adapter for 20 lead SSOP packages. This adapter is wired one-to-one. 20SSO17-D6-ZO 20 Pin SSOP Open top adapter for 20 lead SSOP packages. This adapter is wired one-to-one. 20SO21-D6-ZL 20 Pin SOIC Closed top adapter for 20 lead SOIC packages. Socket and DIP pins are wired one-to-one. 20SO30A-D3-ZO 20 PinZIF socket adapter for devices in 7.55mm (300 mil) wide body SOIC packages. 20SSO21-D3-ZO 20 Pin SSOP and TSSOP to DIP rows adapter for devices in 208-mil, 5.2mm wide, 20 lead SSOP package. 20SSO21-D3-ZO-S 20 Pin SSOP and TSSOP to DIP rows adapter for devices in 208-mil, 5.2mm wide, 20 lead SSOP package. 24QFN16-D6-ZL-S 24 pad QFN MLF adapter is wired signal connection one to one. 24QFN16-D6-ZLS-P 24 pad QFN MLF adapter is wired signal connection one to one. 24QFN20-D6-ZL-P 24 pad QFN MLF adapter is wired signal connection one to one. 24QSO-D3-ZO 24 Pin ZIF socket adapter for devices in 4.4MM wide body SOP packages. Generic one to one wiring. 24QSO30A-D3-ZO 24 Pin ZIF socket adapter for devices in 4.4MM wide body SOP packages. Generic one to one wiring. 24SO30A-D3-ZO 24 PinZIF socket adapter for devices in 7.55mm (300 mil) wide body SOIC packages. 24SO30A-D6-ZO 24 PinZIF socket adapter for devices in 7.55mm (300 mil) wide body SOIC packages. 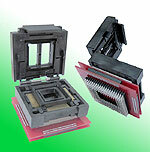 24SSOS15-D6-ZO 24 Pin SSOP ZIF socket adapter for devices in 6.0mm (154 mil) wide body packages. Generic adapter, pins are wired 1 to 1, DIP pin to socket pin. 28PL-D6-ZAL 28 Pin PLCC The adapter is wired one-to-one. 28QFN26L-D3-ZL-P 28 pad QFN MLF adapter is wired one to one. QFN pin 25, center QFN contact on the chip side facing adapter PCB pins DIP 1 and DIP 20 is connected to pin DIP 1. All other pins are one to one. 28QFN26R-D3-ZL-P 28 pad QFN MLF adapter is wired one to one. QFN pin 25, center QFN contact on the chip side facing adapter PCB pins DIP 1 and DIP 20 is connected to pin DIP 28. All other pins are one to one. 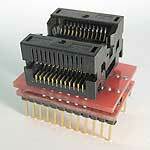 28QFN26L-D6-ZL-P 28 pad QFN MLF adapter is wired one to one. 28QFN26R-D6-ZL-P 28 pad QFN MLF adapter is wired one to one. 28QSO-D6-ZO 28 Pin QSOP to DIP adapter for 28 lead QSOP package. Generic adapter wired pins one to one. 28SO30A-D3-ZO 28 Pin ZIF socket adapter for devices in 300 mil wide body SOP packages. Generic one to one wiring. 28SOJ30-D6-ZO 28 Pin ZIF socket adapter for devices in 300 mil wide body SOJ packages. Generic one to one wiring. 28SOJ35-D6-ZO 28 PinZIF socket adapter for devices in 350 mil wide body SOJ packages. Generic one to one wiring. 28SSO17-D3-ZO 28 PinZIF socket adapter for devices in 5.7mm max wide body SSOP packages. Generic one to one wiring. 28SSO21-D3-ZO 28 PinZIF socket adapter for devices in 5.7mm max wide body SSOP packages. Generic one to one wiring. 28SSO21-D6-ZO 28 PinZIF socket adapter for devices in 5.7mm max wide body SSOP packages. Generic one to one wiring. Socket is 32LQ50S15050 open top ZIF socket. Socket is 32QN150S15050 closed top ZIF socket. 32QFN26-D6-ZL-P 32 pad QFN MLF adapter is wired one to one. 32QFN26-D6-ZL-PS 32 pad QFN MLF adapter is wired one to one. 32QFS31-D3-ZO 32 pad QFP, TQFP adapter is wired one to one. 32SO30-D3-ZO 32 Pin ZIF socket adapter for devices in 300 mil wide body SOIC packages. Generic one to one wiring. 32SO42-D6-ZL 32 Pin ZIF socket adapter for devices in 425 mil wide body SOP packages. Generic one to one wiring. 32SO42-D3-ZO-S 32 Pin ZIF TSOP to round DIP pins for production sockets. Generic one to one wiring adapter. 32SO42-D3-ZO 32 Pin ZIF TSOP to square DIP pins. Generic one to one wiring adapter. 32SO42-D6-ZO 32 Pin ZIF TSOP to DIP generic one to one wiring adapter. For 20 mm Leads tip to tip leads. 38TS06-D6-ZO 38 Pin TSOP Type 1 socket to 38 pin DIP adapter. Connections are wired pin to pin all pins. Square wire wrap DIP pins mounted on 100 mil centers. DIP rows are 600 mils apart. 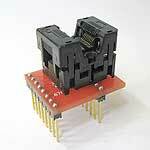 40QFN16-D6-ZL-P 40 pad QFN MLF adapter is wired one to one. 40SO44-D6-ZO-P 40 Pin adapter for devices in 440 mil wide body SOIC packages. Generic one to one wiring. 40SO44-D6-ZO-S 40 Pin adapter for devices in 440 mil wide body SOIC packages. Generic one to one wiring. 40SOJ40-D6-ZO 40 Pinadapter for devices in 400 mil wide body SOIC packages. Generic one to one wiring. 40TS20-D6-ZL-P 40 Pinadapter for TSOP Type 1 packge. Generic one to one wiring. 44PL-D6-ZAL 44 Pin PLCC open top ZIF socket to DIP male pins. This adapter is wired one-to-one. 44PL-PL-PG-ZL 44 Pin PLCC closed top clamshell type ZIF socket to PLCC male plug. This adapter is wired one-to-one. 44QFN20L-D6-ZL-P 44 pad QFN MLF adapter is wired one to one. QFN pin 39, center QFN contact on the chip side facing adapter PCB pins DIP 1 and DIP 44 is connected to pin DIP 1. All other pins are one to one. Bottom pins are square wire-wrap and DIP rows are 600 mils apart. 44QFN20R-D6-ZL-P 44 pad QFN MLF adapter is wired one to one. QFN pin 39, center QFN contact on the chip side facing adapter PCB pins DIP 1 and DIP 44 is connected to pin DIP 44. All other pins are one to one. 44QFN26L-D6-ZL-P 44 pad QFN MLF adapter is wired one to one. 44QFN26R-D6-ZL-P 44 pad QFN MLF adapter is wired one to one. 44SOJ40-D6-ZO-P 44 Pin adapter for devices in 400 mil wide body SOIC packages. Generic one to one. 44SOJ40-D6-ZO-S 44 Pin adapter for devices in 400 mil wide body SOIC packages. Generic one to one. 44SO52-D6-ZL 44 Pin adapter for devices in 520 mil wide body SOIC packages. Generic one to one wiring. 44SO53-D6-ZL 44 Pin adapter for devices in 530 mil wide body SOIC packages. Generic one to one. 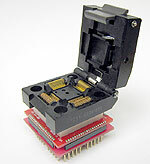 48QFN16-D6-ZL-P 48 Pin adapter for 6 x 6mm body, 0.4mm pich packages. Generic one to one. 48QFN16-D6-ZL-S 48 Pin adapter for 6 x 6mm body, 0.4mm pich packages. Generic one to one. Bottom pins are round solder tail and DIP rows are 600 mils apart. 48QFN20-D6-ZL 48 Pin adapter for 7 x 7mm body, 0.5mm pich packages. Generic one to one. 48QFN20-D6-ZL-S 48 Pin adapter for 7 x 7mm body, 0.5mm pich packages. Generic one to one. 48QFS20-D6-ZO 48 Contact TQFP QFP socket to DIP pins adapter. 56QFN20-D9-ZL-S-L 56 Pin QFN adapter that is wired one-to-one. 56QFN20-PG-ZL-S-L 56 Pin QFN adapter that is wired one-to-one. 56TS09-D9-ZO-S 56 pad ZIF Test socket for TSOP package to DIP breadboard adapter converts SMT package with pitch of 5mm to two 900 mil DIP pin rows. DIP pin 1 is connected to SSOP pin 15 and DIP pin 56 is connected to TSOP pin 14 so that this adapter can be plugged directly into a DIP socket for the same chip in a DIP package. Pin 1 is connected to TSOP pin 15 and DIP pin 56 is connected to TSOP pin 14. 56TS20-D9-ZO-S 56 pad ZIF Test socket for TSOP package to DIP breadboard adapter converts SMT package with pitch of 5mm to two 900 mil DIP pin rows. DIP pin 1 is connected to TSOP pin 15 and DIP pin 56 is connected to TSOP pin 14 so that this adapter can be plugged directly into a DIP socket for the same chip in a DIP package. 64QFN20-64D9-ZL-S-P 64 Pin QFN Closed top adapter that is wired one to one. 64QFN20-64D9-ZO-S-P 64 Pin QFN open top adapter that is wired one to one. 64TST2-47-ZO-D6 64 Pin TSOP Type 2 adapter that is wired one-to-one. 66SSOS40-D9-ZO-S 66 Pin SSOP socket on a 0.1 inch hole pattern male pin breadboard pattern. DIP rows pins are 0.9 inches apart. 80QFR31-PG-ZL-P 0.8mm Pitch, 8O Pin TQFPsocket to wire-wrap square pins for a 0.1 inch breadboard hole pattern. 80QFR31C-PG-ZL 0.8mm Pitch, 8O Pin TQFPsocket to wire-wrap square pins for a 0.1 inch breadboard hole pattern. 80QFR31C-PG-ZL-S 0.8mm Pitch, 8O Pin TQFPsocket to wire-wrap square pins for a 0.1 inch breadboard hole pattern. 80QFS20-PG-ZL 0.5mm Pitch, 8O Pin TQFPsocket to wire-wrap square pins for a 0.1 inch breadboard hole pattern. 80QFS26D-PG-ZO-S 0.65mm Pitch, 8O Pin TQFPsocket to solder-tail pins for a 0.1 inch breadboard hole pattern. 84PLCC-84D15-ZO-S 84 Pin PLCC PLCC socket on a 0.1 inch hole patten male pin breadboard pattern. DIP rows pins are 1.5 inches apart. DIP rows are 1.50 inches apart. 100QFR26C-PG-ZL-S 100QFP Adapter with hinge lid test ZIF QFP socket on a 0.1 inch hole pattern male pin breadboard pattern. 100QFS20-PG-ZL-S 100QFP Adapter with hinge lid test ZIF QFP socket on a 0.1 inch hole pattern male solder-tail pin breadboard pattern. 144QFS20-PG-ZO-S 100 QFP Adapter with hinge lid test ZIF QFP socket on a 0.1 inch hole pattern male pin breadboard pattern. M160-QFS26A-PG-ZL-S 160 Pin QFP Adapter with closed top clamshell ZIF socket to 0.1 inch breadboard pins. 208QFS20-PG-ZO-S 208 Pin QFP adapter with open top clamshell ZIF socket to 0.1 inch breadboard pins. 256QFS16-PG-ZO-S 256 Pin QFP adapter with closed top clamshell ZIF socket to 0.1 inch breadboard pins.